Cell in tissue plays a defined role as being a member of a small cell subunit within a larger organic structure. The development and differentiation of a given cell is defined by the parent cell and the local cell neighbourhood and environment. Consequently, the analysis of cells in their local environment is of major importance. StrataQuest analysis software contains specific image processing tools for the characterization of the social situation of cells in tissue. Apart from distance measurements there are tools to identify relationships of specific cells by selecting all cells in a local neighbourhood or functional group as a separate population. The depicted skin sample was stained using the Multi-epitope Ligand Cartography (MELC) method (Fig. A). The tissue sample is subjected to repeated cycles of fluorescent staining, imaging and photo bleaching. Each cycle can use another antibody for a different antigen. The result is a set of images showing the distribution of each antigen in a different layer for the same sample. The job for StrataQuest in this skin sample was to detect all cells and Melan-A positive areas (Fig. B). Based on this location information, the increase or decrease of the 90 antigen intensities in the areas vicinity was quantified . On this behalf, the Melan-A positive areas were automatically detected and distance transformation masks were established around each of them (Fig.C). The epidermis was also automatically detected (Fig. D). StrataQuest has the capability to perform these automatic detection, measurement and analysis steps for any functional group of cells in such samples. 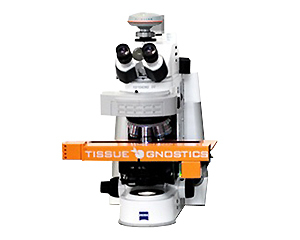 TissueGnostics develops systems for automated identification and functional characterization of single cells in tissue sections, cultured and smeared cells as well as TMA. This includes automated image acquisition and image processing for immunohistochemistry, multi-chanel immunofluorescence and hematology.